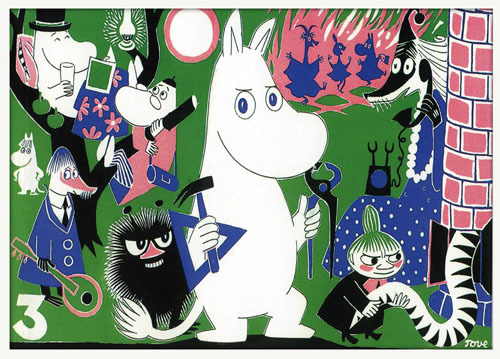 The Moomins are the central characters in a series of books, and a comic strip by Swedish-speaking Finnish illustrator and writer Tove Jansson, originally published in Swedish by Schildts in Finland. They are a family of white, roundish fairy tale characters with large snouts that make them resemble hippopotamuses. The carefree and adventurous family live in their house in Moominvalley, though in the past, their temporary residences have included a lighthouse and a theatre. They have had many adventures along with their various friends. In all, nine books were released in the series including five picture books and a comic strip being released between 1945 and 1993. Moomintroll also referred to as "Moomin" in some of the English translations: The little boy of the family, interested in and excited about everything he sees and finds, always trying to be good, but sometimes getting into trouble while doing so, he is very brave and always finds a way to make his friends happy.